From Cairo: Are you Obama? “Are you Obama?” Imagine my surprise when young and old yelled this question to me as I walked through the Giza Pyramids; Cairo University; and through crowded city markets. Being blonde and blue eyed, I realized when I questioned them they were asking me if I was American. I had to smile and realize an era has passed. Not many years ago in a small patisserie in Paris, a young man asked me in French, if I was Russian? When, I said, “no.” The young man was certain I was Hungarian. When I had to say “no” again, he looked at me with confusion. I said in French, I was American. Immediately without a breath, the young man began a stream of “George Bush, il tue. il tue. il tue.” All the while matching his words with chopping motions with his hands. This was not an unusual conversation in Europe once someone discovered I was American. I recall another incident with a train ticket attendant in Geneva who was polite up to the point I presented my American passport. All of a sudden, the discreet oblique Swiss personality became a political beast at the ticket booth. A new era truly has arrived. “Are you Obama?” made me think of Election Day in Washington, D.C., where citizens waited for hours to vote. Many had never voted before in their lives. They had hope. On Inauguration Day millions came from around the country to attend the ceremony on the Mall. With temperatures close to freezing, the only warmth was being pressed into the crowd of mink coats. It was a solemn day as though it was the largest church service ever held in public with tears shed after President Barack Obama repeated the official oath. This is America. From where I stood at the Lincoln Memorial where Martin Luther King, Jr. gave his famous speech “I Have a Dream” to standing at the Giza Pyramids in Cairo, Egypt with young kids yelling, “Are you Obama?” made me realize the contagious nature of hope. With hope, there is undeniable respect for the President of the United States for his courage to visit the ‘pyramid’ of Islam in Egypt, the Mosque of Sultan Hussein and then visit the Giza Pyramids of Egypt. One elderly professor of the arts commented on the brilliance of this move to first visit their highest mosque and then visit their greatest pyramids. The young and the old; the educated and the poor; and, the faithful and the secular recognized immediately the symbolism. Of course, the more educated individuals were hopeful that actions would accompany this euphoria. The hope for security and prosperity is lifting the spirits of the young with the hope for prospects of economic opportunities and success. I recall years ago Andrew S. Natsios, then Administrator for the U.S. Agency for International Development said at a humanitarian conference in D.C. to make sure young boys have something productive to do, if not, young men between the ages of 15 and 30 create security challenges. Now is our chance to match words with actions. It is time to develop trade opportunities; remove trade barriers; offer technical assistance to develop and improve products to guarantee a higher starting price; offer educational exchanges; and, when working within various communities incorporate common sense practices to improve the environment and quality of life. 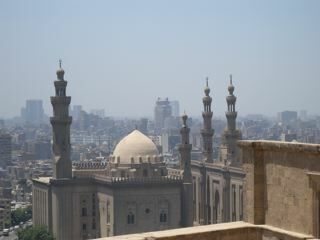 I am curious to know how much foreign investment has been made to the Egyptian Museum in Cairo or to the Giza Pyramids. I am also curious to know how much money has been made off of Egyptian treasures. Questions linger. Why aren’t there educational panels available in various languages? Or, for all of the films produced – why aren’t they available? Why aren’t trash removal and public toilet facilities just part of the program? Why are protective barriers not in place to preserve the ancient structures and art from the elements and countless visitors? It shouldn’t take a presidential visit to pave the streets around a cherished mosque or a royal visit to create a road to the pyramids. If so, advise heads of state and royal families to visit often and different sites. However, realistically, in our bilateral co-operations, we should look to incorporate common sense solutions to the larger picture of the future for young people; economic and security stability in the region; and, especially for the preservation of monuments of world history. Are you Obama? Are you doing what is right? Tags: Egypt, International, Obama, Ode magazine, Phtography, Travel. Bookmark the permalink.